It’s fun to make paper snowflakes. And I’ll bet you’ll be surprised as to all the great Christmas Crafts you can do with them. Snowflakes are miracles of beauty, each one a masterpiece of design. From our earliest memories, we can remember being told that “no two snowflakes are the same.” As it melts, its form is lost forever- no record left behind of its beauty. So is the same with paper snowflakes. Any small variation in cut renders a different design. Snowflakes have become an integral part of winter decorations. We can remember making them as children and hanging in the windows. But do you remember how to make them? By the way, did you know that snowflakes are always in the six sided shape of a hexagon? Well, if you are looking for a pattern to fold a piece of paper so that you can make snowflakes, here is the one I created. Just click to download the Snowflake Fold Template. This pattern will be the start of many great projects and it’s free. To make cutout paper snowflakes, fold the paper for a six sided snowflake. Cut away a few pieces of the paper. Unfold carefully and flatten. Now you have a snowflake cutout design. To make a stencil, place the cutout on a full sheet of paper (or stencil film if you want a permanent stencil for multiple uses). Trace around all the edges and then cut out with a craft knife. Now you have one cutout and one stencil. You’re ready to start creating some fabulous crafts with these simple designs. Don’t forget that you can put the designs on a copy machine and reduce or enlarge the size to fit your project size. Here are a few ideas of what you can do with snowflakes and stencils. And of course we provide the complete how to instructions and inspiration. For a simple and elegant centerpiece, you can create a 3-D arrangement using snowflake patterns. Check out this page for the details and a picture of the finished project. You’ll also find some other tips on what you can do with a 3-D snowflake. If you like the 3-D snowflake centerpiece, you'll love the snowflake arrangement I made to hang from the chandelier. Want to know more? Just click over to Make a Snowflake Make a Snowflake for the details. One of the biggest stressers at this time of year is finding the perfect gift for everyone on your list. Well, don’t fret anymore. I have some great ideas on using snowflake designs to create a variety of gifts. You’ll see that by customizing the gifts, you can make something for everyone. Also, there are some tips on embellishing the wrapping with snowflakes too. In our effort to bring to you a complete solution for all of your stenciling needs in one place, we now have a catalog for you to browse a large variety of designs. So, check out our Stencils Catalog for your next project. 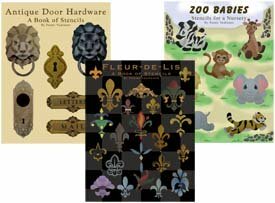 Or if you'd rather get your Stencil Pattern Books in Print, (like these) then visit our Printer's Book Shop for a large variety of stencil collections. These books are easy to follow and come with complete instructions. You'll find all of the stencil designs used as samples throughout this site. 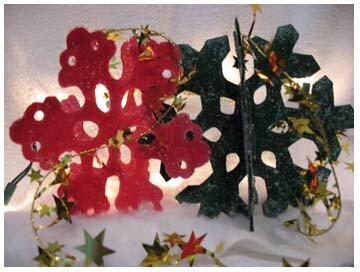 Stencil Designs and Paper Snowflakes used on this web site are courtesy of Designs From Penny. Wait! Here's a video with more fun Christmas Craft Ideas! Return to Home Page from Paper Snowflakes. Return to Christmas Crafts from Paper Snowflakes.